Well my first location has been running for over a week now without problems except for a day when some work was being done on one of the buildings, so its on to location 2. This installation should be easier than the first one as the offices are accross the street from each other (approx. 150 yards). 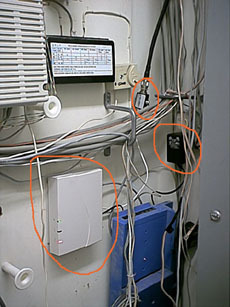 The purpose for this connection is to allow the office across the street to share the DSL connection at the clinic and there by eliminate the need for a T1, DSL connection, and router there. 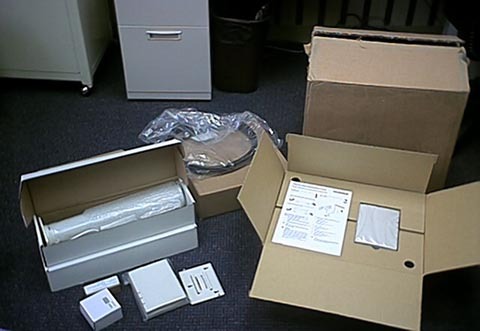 For the price of the router we got the kit, the offices will have a 10mips connection, and we will be paying for one Fast DSL connection instead of two medium speed connections. (I will actually be starting them with medium speed service and increase the service if needed.) Expected savings is over $100 per month and over $500 for the T1 we are elimitating. I got up on the roof and began seting things up. The cable will go through the roof via a hole for an existing antenna cable. I am mounting the mast at the point closest to the hole. I cut the mast to fit after mouning the brackets to the wall. 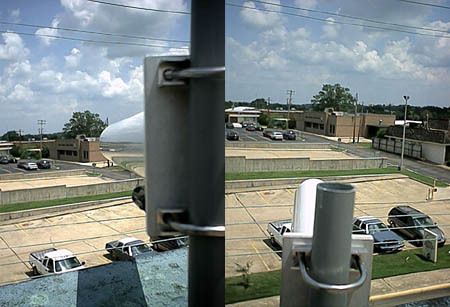 Once the mast was in place, I mounted the antenna and aimed it at the building across the street. 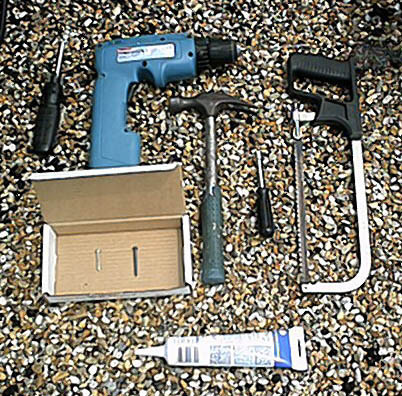 Just in case you are wondering, here are the tools I used to mount the antenna, cable and transmitter: screw driver, drill with masonry and sheetmetal bits, hammer (starter holes in concrete), 7/16th nut driver for U-bolts, hack saw for cutting mast to size, sheet metal screws and masonry screws, and 1 tube of clear silicone caulking. So now the antenna is up. I dropped the cable through the hole and went to the shared electrical closest on the third floor and pulled it through. I am using the 50' cable at this location as I am not concerned that there will be a significant signal loss. Forunately, my measurements were correct and the cable was the right lenght with a 1' to spare. I attached the supplied mounting bracket to the wall (with the supplied screws), slid the transmitter on, connected the lighning arrester and cable, and then plugged it in. I also grounded the lighting arrester. From here, I ran my Cat5 down to my network on the second floor. I also went back on the roof and resealed the hole in the roof with silicone. I suspect I am going to need to apply some roof tar to the antenna cable so that it doesn't blow around in a storm. This is tornado country and we occationally get high winds. I'll be back next week and put the other antenna up and get them talking. 7/30/02 Today I am installing across the street. 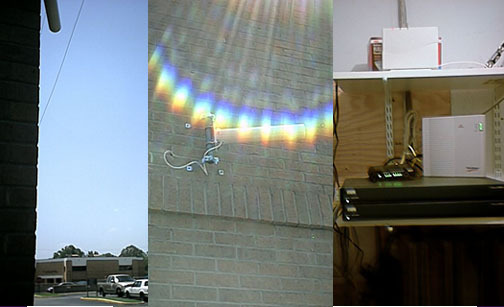 After studying the layout of the building, I decided to mount this antenna on the side of the building, near the back. As I am having to do this as a one man job, this was the best solution for this location. I am using the 50' cable that came with the kit, 1' of antenna mast, and another 4" mast kit from Radio Shack. I also had to buy a 3/4" masonry bit to go through the wall. Other than the fact that I am having to drill the hole in the brick for the cable to go through myself, there is nothing really different about this installation than the others already mentioned. I plan to be back Friday to setup the PCs to use this connection. 8/2/02 It works. No surprise. While the photo's don't show it, you can see the antenna's from one another. The shot at the right shows the router sitting on the shelf above the hub, DSL modem, and old and new Cisco 26xx series routers that are also used at this location. One other thing that I was reminded of when setting this connection up was that it is probably a good idea to set a different network password (the password the routers us to talk to each other) than the STMP management passwords you use for programming the routers. Something else I recommend doing is keeping a notebook with all of the documentation, a list of addresses, password hints, and configurations (the routers configurations can be saved to disk) and kept in a safe place. At some point I suspected atleast one of the units will get zapped either by lighting or from near by equipment and I will want to be able to configure another router quickly. As with the first installation, I'll update this page if I discover anything notable. Copyright CPUJocky Pages, 2000-02. All rights reserved. Contact author for further details. Remember I was asleep when I wrote most of this.